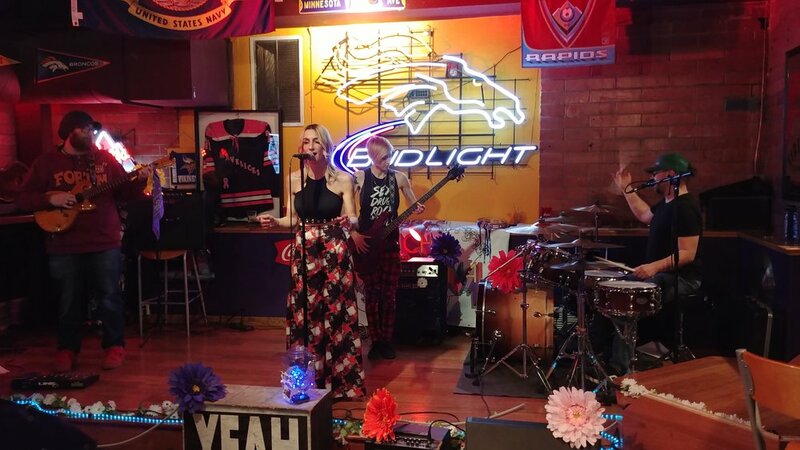 Peach Street Revival opened up their Friday night set at Cruisers with a dynamic trio, Greta Van Fleet’s “Safari Song”, their original “Beautiful Mind” and Led Zeppelin’s “Good Times, Bad Times”. While all three are musically similar, the ability to make them all come off as well as their own original is something to take notice of. Much like GVF, Peach Street Revival are finding success by bringing the sounds of classic rock to a modern audience. Formed by lead singer Gonzales and bassist Jordan Will, Peach Street Revival have caught a lot of attention in a little over a year. They recruited Cooper Schull just as The Navigators were ending their group, bringing his impressive guitar skills and effortless ability to blend classic and modern rock sounds. Drummer extraordinaire Rob Labig rounded out the group, providing his skills that he has taught to dozens of students over the years, as well as his ability to play everything from big band to hard rock. The four bring years of experience and talent between several bands and projects, which results in the right mix of professionalism and chemistry. The crowd at Cruisers on Friday, January 18 came in looking for the sound PSR was providing. They followed up their initial songs with a seat clearing set of classic rock before taking a short break. As the second set began, a slow transition between those who grew up with classic rock headed home, while younger fans took to the dance floor. It is rare to see 20 and 60 somethings on the same dance floor, but the wide appeal of their sound brought that and more. Said one fan, who was introducing his girlfriend to the band, “They sound just like they were in the studio”. The stage at Cruisers is not big, but between Rob’s deft volume control and Gonzales’s vocal performance, it sounded just as good as a large arena. Indeed, crowd interactions and enthusiasm made a Friday night at the bar feel like an important concert. This happens often with touring bands at Cruisers who have learned how to properly play a room by size and not overpower it. By the time Gonzales was performing “Fat Bottom Girls”, she had the crowd into it enough to have a rockstar moment of turning the mic to the crowd to sing the chorus. A particular highlight that could be overlooked by those spoiled by the flawless performance so far was a take on The Rolling Stone’s “Give Me Shelter” where Gonzales covered both parts of the duet, while Cooper shredded Keith Richards solos with apparent ease. A tribute to Aretha Franklin highlighted the final set, as the band ended where they began with Zeppelin’s “Black Dog”. Along the way more originals were mixed into a classic rock set that paid tribute to its roots, while done without base imitation. Peach Street Revival just released a studio version of their original “Beautiful Mind”, recorded at Fusion Audio Solutions with Taylor Riley. Expect more announcements and recordings in 2019. Editor’s note: This turned out to be the last show for Rob Labig with PSR. Rob continues to teach drums at Back Porch Music and play with a variety of acts in the area, including El Camino Burnout.